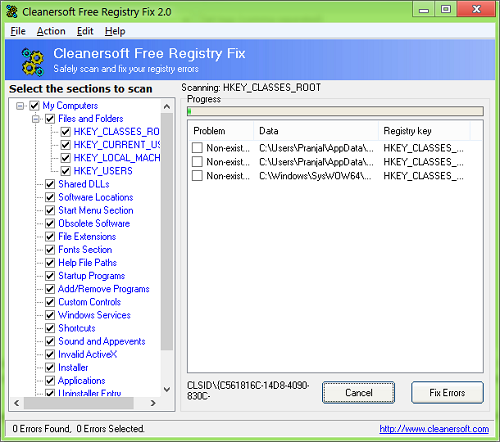 Cleanersoft Free Registry Fix is a free little app that helps you to get rid of all your registry related issues on your Windows XP, Vista, 7, or Windows 8 machine. The app runs flawlessly on these variants of the Windows OS, and does not lag or crash or hang. The app makes sure to get rid of all the problems that it finds on your system registry. Upon launching the app, you will be presented with an interface which has the options to either scan for errors, or to fix these errors that it finds. Cleanersoft Free Registry Fix finds the registry problems in very little time, and allows you to easily fix these problems with just a click of a button. You can select the areas of registry to be scanned from the left side pane, and it will scan only the areas that you have selected. It is truly a no-nonsense, no-bloat software, that is totally free from ads. The app has a clean interface, and is crisp and to the point. 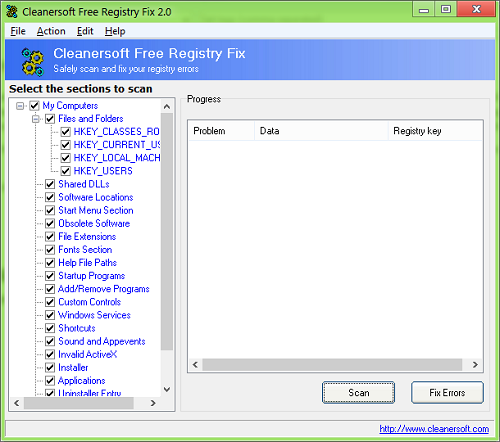 Cleanersoft Free Registry Fix is available as a free download. When you install and launch Cleanersoft Free Registry Fix, you will be presented with a window that looks like the following window. In the above window, as you can see, towards the left is a pane which shows you the various areas of the registry that can be scanned using the app. You can scroll through this pane, and select whatever areas you want to scan. If you don’t want a particular area to be scanned for errors, simply untick the option that you don’t want to be scanned. Once you are done with all these steps, the next step is to click on the Scan button. 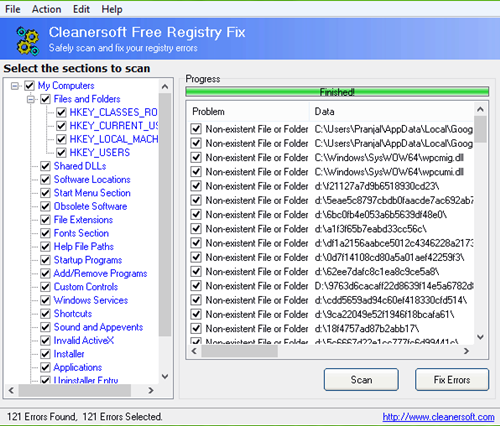 As soon as you click on the Scan button, the Cleanersoft Free Registry Fix software will begin scanning your system for any kinds of registry errors or problems. While your system is being scanned, you will be presented with a window that looks like the following screenshot. As you can see in the above window, the software has barely started with checking for registry errors (as you can see from the progress bar at the top), and it has already found three registry problems in my system! All the registry problems will be displayed on the right pane of the software. Once you are done with running the scan for registry errors and problems, select the problems that you want to get rectified, and click on the Fix Errors button at the bottom-right corner of the screen. Once the Scan has been completed, you will be presented with a screen that looks like the following window. As you can see in the above screenshot, the app has found 121 errors with my system (see lower-left corner). Click on the Fix Errors button to fix these errors! Fixing of errors may take some time depending on your system’s performance, and you will receive a confirmation message once all the errors have been fixed. That’s all. You should be all equipped and ready to begin using the Cleanersoft Free Registry Fix software now. While you are at it, you can also check out a list of 6 registry cleaners that also perform the same task of cleaning up your system’s registry! Cleanersoft Free Registry Fix is a great app to have on your Windows device to free it from any and all sorts of registry errors. It’s a must have tool for people who want to free their system from registry issues, as well as those who want to see a major performance bump in their machine. Get Cleanersoft Free Registry Fix.